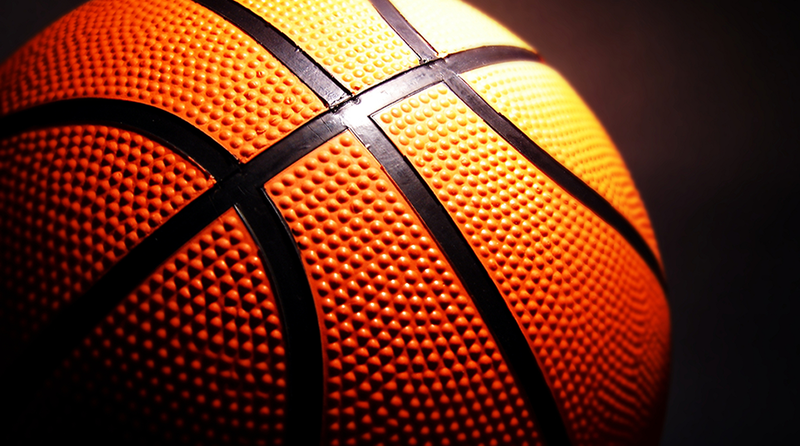 Twitter in the Real World: Stephen Curry breaks the internet - HMG Data Services, L.L.C. One Saturday, the NBA world was watching as Steph Curry of the Golden State Warriors put on a record performance. The final score was 121 to 118 with Golden State taking the win. Stephen Curry sank 12 record tying 3 pointers, one of which was fired from 32 feet out. The NBA world new that this was a historic game, but the NBA universe wasn’t the only ones to notice. Who else noticed? Twitter. Yes, you read that correctly! Twitter also put up some serious numbers as the game went on and as the tweets rolled in, so did the lessons in social media. That’s what we will discuss in this edition of Twitter In The Real World: Stephen Curry. a. Lebron James boasts over 24.8 million Twitter followers. That means that anyone who followed him would also be a recipient of that tweet. We don’t know how many of his followers were on at that moment, but we do know that @StephenCurry30 was placed before the millions that were. b. At the moment of this screen capture, this tweet had been retweeted more than 83,000 times and liked more than 82,000 times. That means that the followers of Lebron James, at least 83,000 of them, were excited enough to retweet this message to all of their followers too and them to their followers and on and on. In this context, the reach of that single tweet was seen by users and caused them to act by retweeting and/or favoriting it themselves. Did you get that? They took action. Businesses often advertise with the intention of motivating the recipient to take action. Here action was taken more than 160,000 times. c. While we are on the subject, Twitter followers often share the same friends so with each retweet, the brand is being placed before the viewer over and over again. The more people to see the tweet the more awareness for @StephenCurry30. True, a person won’t fall in love with something or someone by seeing their name one time, twice or even three times, but the familiarity with Stephen Curry increased exponentially through this one tweet. 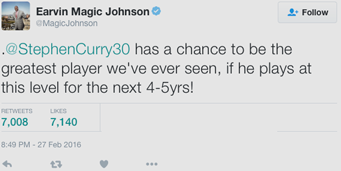 The next example is from Earvin Magic Johnson who goes by the Twitter handle @MagicJohnson. 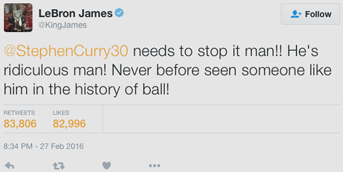 Now, I know what you may be thinking… What does a retired NBA player have to do with Stephen Curry and Twitter? Take a look at his tweet and I’ll tell you. o Magic openly stated that StephenCurry30 is on the verge of being the greatest player EVER! Keep in mind that Magic Johnson played with Jordan, Bird, Abdul-Jabbar and other NBA elites and he is publicly recognizing Stephen’s abilities. What does this do for Stephen’s credibility? It obviously skyrockets, but why? It is due to the credibility that comes from a third party. It is one thing to talk about how amazing your service and your product is, but it is more credible to have someone else do it for you. Not to mention the cool points that are added when the praiser is well known and held in high esteem. Think of the impact that is made each time a third-party endorses you or your product? It says a lot about you and it goes a long way. o Magic has an audience that Lebron doesn’t necessarily have. What do we mean hear? Magic is making strides in the business world. Yes, he is a retired NBA player, but he will have a demographic follow him on Twitter that just may not be so interested in Lebron James. So, if someone is not following Lebron, but is following Magic then that seed still get’s planted and Stephen wins again. Another ‘W’ for @StephenCurry30. So far we have only considered 2 of the hundreds of high profile, celebrity written tweets about Stephen Curry and the Golden State Warriors performance. We also have the tweets that came out in support of Oklahoma city, but that is not the focus of this article. According to Neilsen’s ratings, the game ranked #1 for the Top 5 Daily Nielsen’s Rating for sporting events. To give some perspective, Twitter saw 395,00 unique Twitter authors post about the game, for a total of 1,019,000 individual Tweets providing a whopping 99,497,000 Twitter impressions. When we consider the followers of @KingJames and @MagicJohnson as well as the other 395,000 other tweet authors and all of their followers, the numbers add up very quickly! Here we have examined a real world example of how Twitter works to bring your brand to the masses. To recap: A unique Twitter user sends out a tweet. His/Her followers receive that tweet then favorite or share that tweet to their followers. The awareness of the brand increases along with each impression. This leads to action through Favorites/Re-Tweets and Twitter users are drawn closer to your brand. If you like this article then take a moment and SHARE! SHARE SHARE. Want more? Check out another example of Twitter In The Real World example where we see how Donald Trump used social media during a national debate.